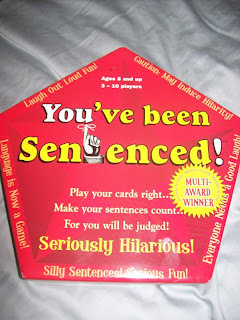 I LOVE games and when I found out that I got to review this new game "You've Been Sentenced", I was very excited. It is a game where you put together different words to make a sentence and then your team mates judge whether it is a good sentence or not. This game is extremely hilarious to play! I played it with my whole family and everyone was laughing the whole time. Here is some of us playing the game! This game is for people ages 8 and up, takes 30-40 minutes to play, and can be played using many different variations. My Opinion: My family had a lot of fun playing this game. It was super easy to learn to play. My dad is not one to love learning a new game and he said that this was very easy to learn, made you think and use correct grammar, and was fun. I would highly recommend this game. 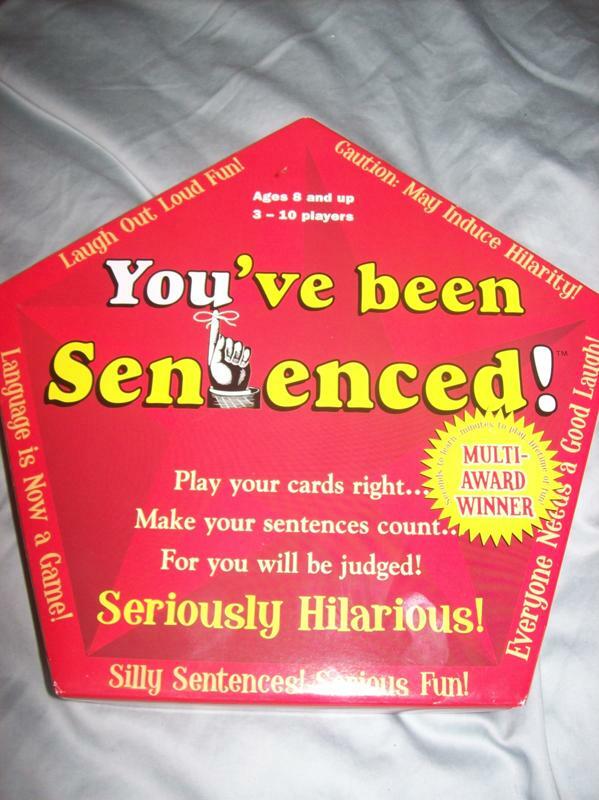 The giveaway will be for one "You've Been Sentenced" board game that retails for $25!! The giveaway is open until Midnight on Sunday September 19th. Winner will be chosen on Monday September 20th using Random.org. ***Please note that company is currently out of stock of these games and the winner will not be mailed their game for about a month. The company promises that you will still get it though! Tell me what is your favorite board game! If you do not like board games, then what is your favorite card game? Oh, I forgot... my favorite card game is Spades. I just subscribed- Great site~!!! my fav board game is sequence! I *think* I first discovered your site through a linky. I entered the Creatio0ns by Shelly giveaway. I entered the Lia Sophia giveaway. My favorite game is Michigan Rummy. Not sure if this is a Canada involved contest :) Hope so! We LOVE board games, play them alost daily as homeschoolers we use them as a part of our learning! Our favorite right now is one called Catan we have had a game of it taking up our dining room table (played for a couple - four hours daily) for a week now! As an English major, I LOVE word games - Scattergories is my fave! Found u thru Monday blog hop! I love all board games, especially Trivial Pursuit! I found your site awhile ago, but I forgot how. I've been following ever since! favorite board game right now is Whats a dame to do! I found your site through This and That low entry lowdown. 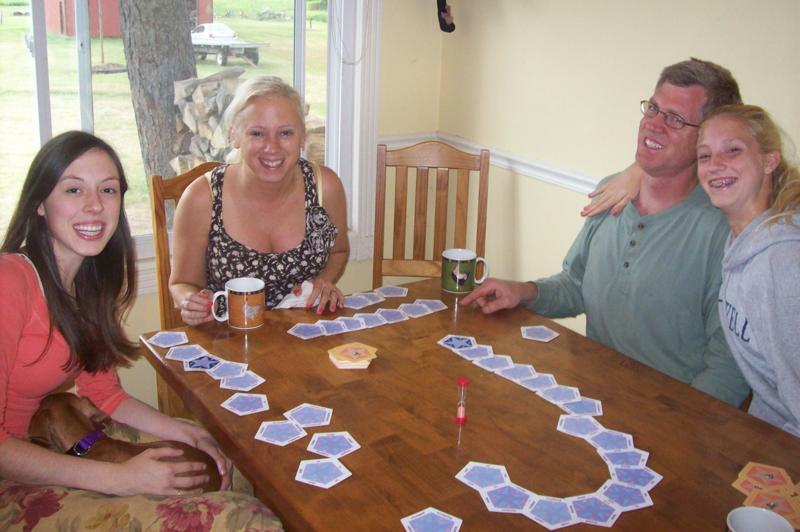 My family loves most board games! One of our favorites is "Settlers of Catan"! I found you on low entry low down. I used to love Clue, but haven't played a board game in a while. this one looks fun! My fave is scrabble, it makes my brain think harder,lol. I love to play hrs. of monopoly with my boys, they are so competitive! LOL The game stays on the table for days! We are a games family as well. I have lots of favorites but one of them is Scattegories. I found you through Spectular Savings. I am a follower of your blog.Love playing Monopoly and Pictionary with my son.